Fatherhood in America is changing. Today, fathers who live with their children are taking a more active role in caring for them and helping out around the house. And the ranks of stay-at-home and single fathers have grown significantly in recent decades. At the same time, more and more children are growing up without a father in the home. The changing role of fathers has introduced new challenges, as dads juggle the competing demands of family and work. Here are some key findings about fathers from Pew Research Center. 1 Dads see parenting as central to their identity. Dads are just as likely as moms to say that parenting is extremely important to their identity. Some 57% of fathers said this in a 2015 survey by the Center, compared with 58% of mothers. Like moms, many dads also seem to appreciate the benefits of parenthood: 54% reported that parenting is rewarding all of the time, as did 52% of moms. Meanwhile, 46% of fathers and 41% of mothers said they find parenting enjoyable all of the time. A sizable minority of childless men (44% of those 18 to 49) hope to become fathers at some point, and another 35% are unsure if they want to become parents, according to a 2017 Pew Research Center survey. Among childless women in the same age group, 50% want to become mothers, while 22% are unsure if they want to. 2 Dads are much more involved in child care than they were 50 years ago. In 2016, fathers reported spending, on average, eight hours a week on child care – about triple the time they provided back in 1965. 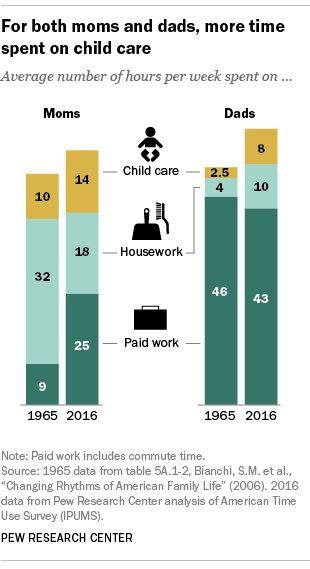 And fathers put in about 10 hours a week on household chores in 2016, up from four hours in 1965. By comparison, mothers spent an average of about 14 hours a week on child care and 18 hours a week on housework in 2016. Dads are also less positive about their own parenting abilities than are moms. Just 39% of fathers said in 2015 that they are doing a “very good job” raising their children, compared with 51% of mothers. 3 Work-family balance is a challenge for many working fathers. Just like mothers, many of today’s fathers find it challenging to balance work and family life. About half of working dads (52%) said in 2015 that it is very or somewhat difficult to do so, a slightly smaller share than the 60% of working mothers who said the same. And about three-in-ten working dads (29%) said they “always feel rushed,” as did 37% of working mothers. Working fathers were also about as likely as working mothers to say they would prefer to be home with their children, but that they need to work because they need the income (48% of dads and 52% of moms said this, the Center found in 2012). Working dads and moms were also equally likely to say that even though it takes them away from their families, they want to keep working (49% vs. 42%). 4 It’s become less common for dads to be their family’s sole breadwinner. About a quarter of couples (27%) who live with children younger than 18 are in families where only the father works. 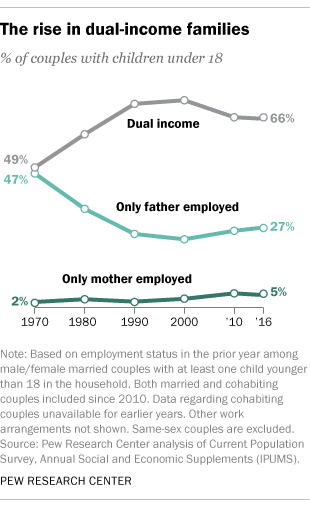 This marks a dramatic change from 1970, when almost half of these couples (47%) were in families where only the dad worked. The share of couples living in dual-earner families has risen significantly and now comprises the majority of two-parent families with children. The public has mixed views about these changes. Breadwinning is still more often seen as a father’s role than a mother’s: About four-in-ten Americans (41%) said in 2013 that it is extremely important for a father to provide income for his children, and just 25% said the same of mothers. At the same time, a majority of the public (67%) said having more women in the workplace has made it easier for families to live comfortably, while about three-quarters said this has made it harder for parents to raise children. 5Despite changing gender roles, many still perceive mothers as better equipped than fathers to care for children. When it comes to caring for a new baby, 53% of Americans said that, breast-feeding aside, mothers do a better job than fathers; only 1% of Americans said fathers do a better job than mothers. Another 45% said mothers and fathers do about equally well, a 2016 survey found. Among the plurality of adults (44%) who said the ideal situation for a young child with two parents is for one parent to stay home, 39% said it’s better if that parent is the mother, while just 5% said a child is better off if the father stays home. More than half (56%) said it doesn’t matter which parent stays home. 6 Most Americans (64%) say men and women have different approaches to parenting, but fathers and mothers don’t agree about the source of those differences. Roughly two-thirds of fathers (68%) who see gender differences in parenting styles say these differences are mostly based on biology, while 31% say they are based on societal expectation. For their part, most mothers (66%) who see differences attribute them to society rather than biology (34%). Overall, more than half (56%) of those who say there is a gender difference in parenting say this difference is a good thing. When it comes to what’s best for children’s playtime, fathers and mothers have somewhat different views. While at least half of both dads and moms say it’s a good thing for parents to encourage their kids to play with toys and participate in activities typically associated with the other gender, dads are less likely than moms to say so: 69% of dads say encouraging young girls to participate in activities typically associated with boys is a good thing, compared with 83% of moms. 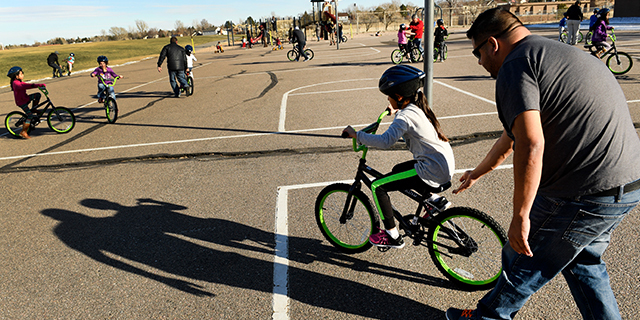 About half of dads (53%) say it’s a good thing for parents to encourage young boys to participate in activities typically associated with girls, compared with 72% of moms. The differences in views between fathers and mothers on this question are similar to what the survey found among men and women more broadly. 7 Seven-in-ten adults say it’s equally important for new babies to bond with their mother and their father. 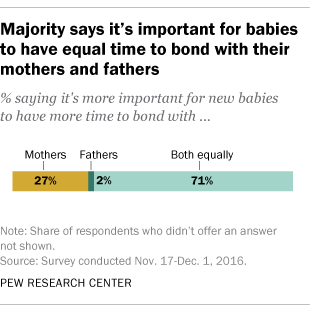 In 2016, about a quarter (27%) said it’s more important for new babies to bond with their moms, and 2% said it’s more important for new babies to bond with their fathers. Women were slightly more likely to say it’s important for new babies to bond with both parents (74% vs. 68% of men). Among those who took time off to care for a new baby in the past two years, fathers took a median of one week off from work for this reason, compared with a median of 11 weeks for mothers. One factor that might contribute to this gender difference: About half of adults (49%) said employers put more pressure on fathers to return to work quickly after the birth or adoption of a new child, while 18% said employers put more pressure on mothers. A third said employers pressure mothers and fathers about equally. Note: This is an update of a post originally published on June 12, 2014.